Plans to run high-speed domestic services upon the CTRL (or, if you like, ‘’High Speed One’’) met formal Government approval on 27th October 2004. The Strategic Rail Authority set the ball rolling on 1st June of the following year, signing a rolling stock contract with Hitachi for the procurement of 28 (later increased to 29) six-vehicle dual-voltage electric multiple units for these services. 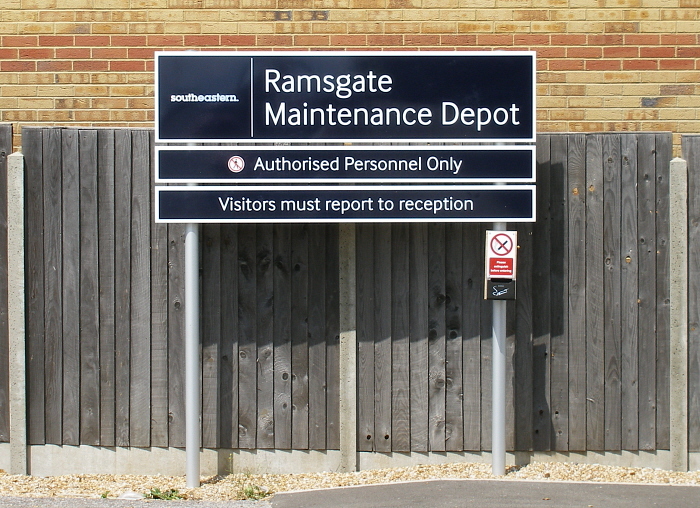 Worth £250 million, the 140-MPH stock was to be maintained at a pair of tailor-made depots located at Ashford and Ramsgate. The ‘’DEPCO Consortium’’ was awarded an £86 million contract for the construction of both maintenance facilities, of which £34 million was allocated to the Ramsgate project. 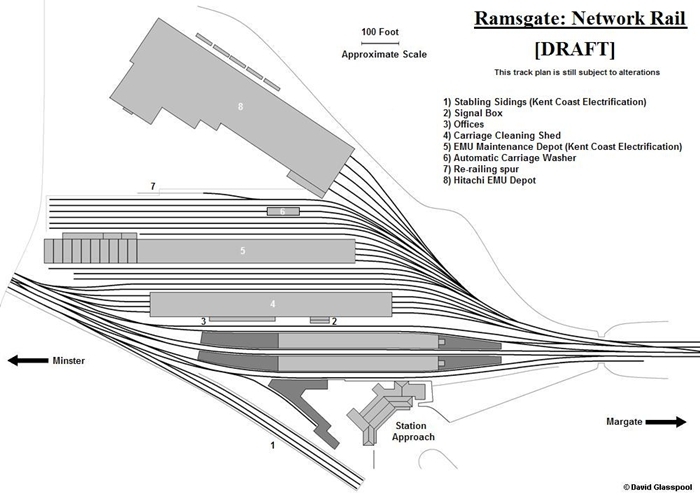 Works at Ramsgate included wholly redeveloping a 10,000m2 area of land residing north of the station. 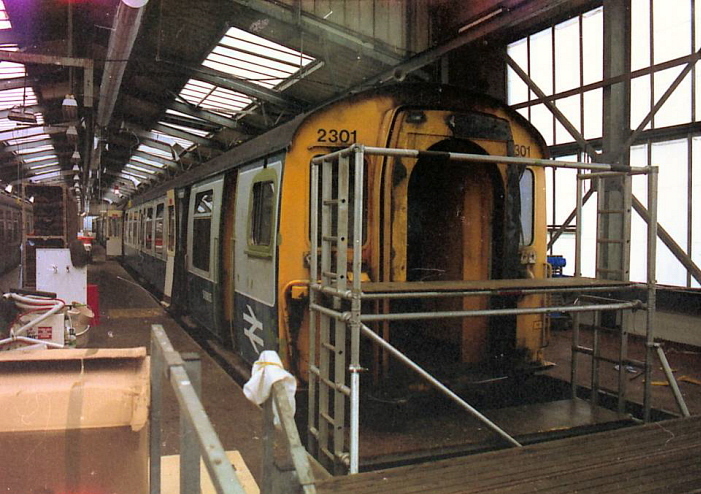 At the time, this was host to an asbestos-clad EMU heavy lift shop at its northern extremity, and between this and the former engine shed existed eight electrified stabling sidings. Some of these were semi-derelict, dating from the Kent Coast Electrification modernisation works over the 1959/1961 period, and had originally replaced stabling sidings for locomotive-hauled stock. Sadly, a significant loss was to be the original Southern Railway goods shed, which still stood about 30-yards north of the engine shed structure. The site was cleared by November 2006, and construction began in March of the following year. The building contract ran for 120 weeks, and saw the erection of a huge 8000m3 maintenance depot on the former site of the EMU heavy lift shop. Measuring 640-feet (195 metres) in length, this colossus of a building accommodates five tracks, and running along its southern elevation is a three-storey-high office block, complete with workshop and stores. Two of the accommodated tracks are designated as ‘’heavy lift’’ roads, and one of these is equipped with ‘’bogie drop’’ equipment. Every track is elevated upon stilts to permit underneath inspection. 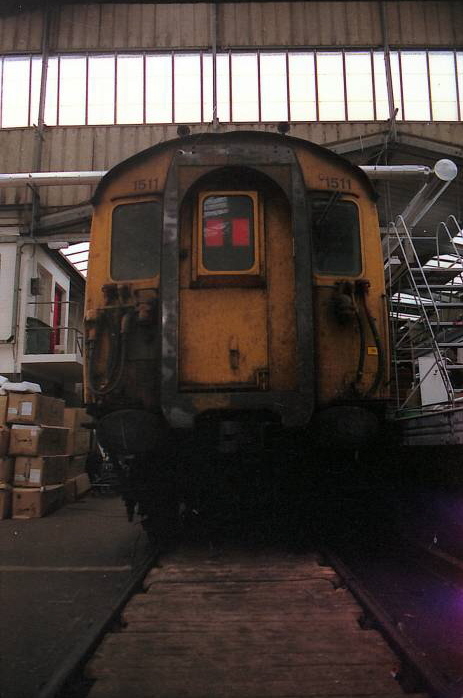 The depot is capable of maintaining both ‘’Electrostar’’ and ‘’Javelin’’ fleets, although heavy maintenance of the latter will mostly be dealt with at Ashford. In-between the new maintenance building and the ex-engine shed (converted into an EMU maintenance depot during 1960) exists seven new electrified EMU sidings, upon the former goods yard site. Capable of accommodating twelve vehicles each, these are equipped with carriage washing apparatus and Controlled Emission Toilet (CET) facilities, the latter permitting the disposal of waste from units’ toilet retention tanks. A short spur emanating from these sidings is also in existence, to permit the railing of rolling stock delivered by lorry (particularly tamper machines and permanent way cranes). The construction of all electrical, mechanical, and telecommunications systems at the new site was undertaken by DEPCO partner EMCOR Rail (UK), and the same company was responsible for similar works at Ashford. It was envisaged that on completion of the depot, 200 new jobs would be created. was in evidence within the heavy lift shop, undergoing a ''C5'' heavy overhaul.